If you are looking for a really unique, really helpful or really innovative gift for that hard to buy for person on your list, I have the perfect website for you to head to today : Hammacher Schlemmer! It is their mission to bringunique products that either solve problems or further their lifestyle! They have some of the most unique products I have ever seen or products that really make me think "Why Didn't I think of THAT!!??" One of my favorite products this year is their The Tight Space Storage Cabinet. This is the compact storage cabinet that holds towels, cleaning supplies, or sundries while only occupying a 12" wide space. 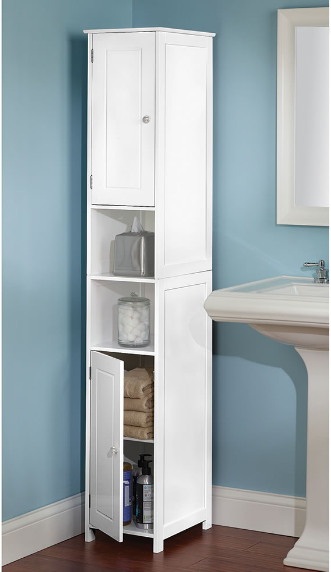 Available exclusively from Hammacher Schlemmer, the cabinet’s narrow footprint is ideal for space-starved powder rooms or narrow hallways in need of a storage solution. The compact closet comfortably accommodates multiple items with a pair of hinged-door compartments and two built-in display shelves. The top compartment hides necessities in its 21" H x 11 1/4" W x 15 1/4" D space and features a fixed internal shelf, while the cabinet’s 20" H x 11 1/4" W x 15 1/4" D bottom section stores towels or linens with an adjustable shelf. Crafted from engineered wood, the clever cabinet is painted white. You can purchase The Tight Space Storage Cabinet for $149.95 from the Hammacher Schlemmer website.